I have the D3200 I love using so at this price for the d3500 you can't go wrong, tip to get the most out of it try get off the auto modes as quickly as you can get use to using the A setting you can't go wrong and the results are impressive. You’re not a photographer and you never will be. Eglobal Central £279 but not sure if they r reliable. Yes, you're right. My bad. £349 is cheapest everywhere else. Good deal then. Further reduction on a great camera! We love it. Very easy to use. Anyone got a link to some sample pictures? Still some available, I just got one from Kidderminster and they reduced it further for me "nice people". There hasn't been available for nearly two weeks, I had the last one available, had to collect from Worcester, not too far (40 miles) from home, managed to combine some business at the same time so made it worthwhile! Don’t put it in a microwave or try and put a film in it either. It's grey. The GPS tagging feature is likely disabled too as is with all Chinese models. Is this a grey import? If so, no warranty.... Rather pay the extra and order from JL for £599 and get two years warranty. it doesnt come with lens. I don't think it would be a bad camera bud, although your going to need a really good telephoto lens depending on where your going to take the picture from. But that wasn't what you said. Your comment dismissed it out of hand because it was a consumer bridge camera, implying that any consumer bridge camera was useless. If you bought the Nikon and enough glass to match the full range of the bridge camera then you'd be spending a lot more than the cost of the bridge camera. Although the Panasonic FX1000 that I mentioned earlier would admittedly be better for price comparison. I know I was very disappointed, so I kept my hotshoe cover from my D90 before I sold it. i know what a hotshoe cover is (lol) i am saying that lots of cameras dont include it despite it costing mere pennies to make dont think i have had an unsealed camera though from a uk seller what does flickr have to do with shutter count? does it have a tool to check? I took a test shot and uploaded it to my flickr The hotshoe cover is the wee slither of plastic commonly missing(stolen) from Currys display cameras. This would be my 6th Nikon and they have always had one - and been sealed - and had a warranty slip Its fine its JL its going back for a full refund tomorrow! I thought the same until I bought a cheap pair and they are total rubbish. Managed to get a pair of Bresser off eBay new for £15 and they are chalk n cheese. You can really tell the difference, crystal clear image. I have a pair of Nikon 8X25 Sport Lites, they're good for bird watching and taking to watch planes at Ringway. Looking through these makes the world seem brighter and clearer...as well as closer...amazing for the £50 I paid for 'em. Ooh. I have a JL Voucher and a Paypal voucher to use. This could work out well! Never miss a 'Nikon' deal again! 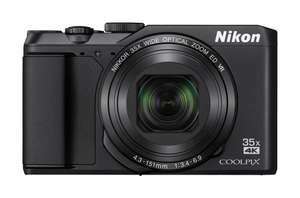 Nikon A900 Coolpix Digital Camera - Black. £214 delivered @ Amazon Deal of the day. oh .. another one of them oh and tempt liked your post - ding! haha, the irony! You really dont get how silly you sound. You haven't liked my posts have you? Been after a flashgun for ages and never got round to buying one. Just reserved! Thanks! £93 squid now. just collected mine. I’ve managed to get two from castle vale in Birmingham and willing to sell the one if someone local wants it. That will have much better compatibility I would have thought. Price drop on latest interation of the D3X00 series. I'm guessing you can contact Amazon to get the difference refunded if it's less than a week? Failing that, send it back under DSR for a full refund and buy again. Great price. I think the D3300 might be better due to sensor cleaning and more physical controls, but for 359 it's great. Nikons sensor is good at higher iso too, not too common below the 400 price point. Agree worth checking to save a trip back but there should be no issue returning for full refund within 30 days if not satisfactory. Had loads of camera gear bargains in Currys over the years they've never quibbled on stuff returned even when I just changed my mind after buying on impulse. Let me guess, you’re a Sony user. The price has come down to £1999 but there is no longer a free XQD card so I've expired this deal. I believe in the US the adaptor is now being included for free, so there's a potential £99 to come off this price, watch this space. You're right, they'd still be cheaper even if the card was worth £200, the card value does help close the gap though and not all users trust or want to go for grey imports. I personally didn't realise how much XQD cards were, I thought they'd be similar to SD! I'm going to be waiting until after the photography show where I'll have a proper look at each, I know last year I really disliked the EVF on the Sony's which is something that you can't tell from YouTube reviews and the likes. Na those cards are about £140 so grey markets is still much cheaper. Haha I knew we’d get along! Joking aside, I have a 1DXii with too much Canon glass to switch, which is a shame because I like the D850 and some of the new line up (the Z7 caught my eye). My biggest problem is the size and weight of the current setup, so was looking for a more compact camera to sit alongside and ended up with a GH5... have you had a go with the Z6/7? Ordered. Needed a second pair of binos for when the wife comes too, Cheers! Cheapest it's ever been according to camelcamelcamel. Erm that is nothing like the lens on offer. Try again Sherlock. Leica, hahaha. I bet you're photography doesn't equate to the money you spend on it. Ever hear the saying "that it's the photographer, not the gear"? . Post a link to your images. The battery is the same in both. The 3500 has a weaker flash and because the battery life is measured taking half of the photos with flash on, the results are misleading. I know the battery is supposed to be really good on the 3500, but ive heard the 5300 is more of a middle weight user camera. Thanks for the advice. 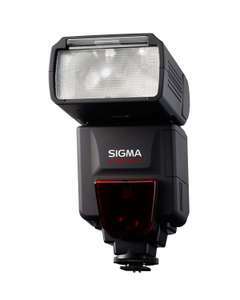 They will both give excellent photos and the sensors are quite similar. The D3500 is a bit lighter and I think it's got bluetooth. 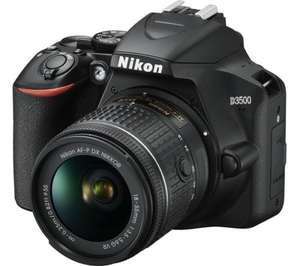 The D5300 has movable screen, GPS and s more powerful built in flash. 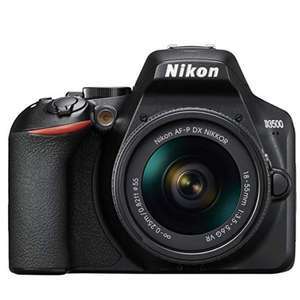 If there isn't too much difference in price I would go for the D5300 for the screen. It makes a lot of difference if you want to shoot down low or above people's heads. I don't think the D3500 has a microphone jack either, but you'd need to check that if you care about it. Einfinity have this lens for about €1050, ok you'll probably have to wait 2-3 weeks for it but a lot cheaper.